We are lucky to have a very close friend and neighbour whose Italian family run Santaniello's a highly successful and well known wood oven Pizza restaurant a little way up the M1 in Bedford. Our friend loves his food, so much so the term "shoving it in" has become a personal catch phrase and at lunch or dinner parties in his own home in Earls Court he always serves the biggest portions of anyone I know. Enormous amounts of anti pasta, pasta, italian bread, primi... secondi... and dolci..... all come tumbling out onto the table presenting diners with a real challenge to stay upright and last the meal. Not easy! In Bedford the eatery is now being run by the third generation and like all large Italian families we hear there is usually an element of high drama rumbling around somewhere in the background but at the end of the day he and the other family members are tight knit and close and of course as a dutiful son he visits his "Mamma" religiously. We have to admit this is extremely fortunate for us too as he always insists on bringing us back a little something from the restaurant in return for keeping his herb garden watered while he is away. He tried the obvious cooked pizzas but they seemed to loose lost some of their appeal halfway down the motorway so now we are honoured to get gifts of lovely fresh pizza dough balls made by Antonio the restaurant chef of some thirty years on his return. This wonderful dough is the real McCoy and we would love to be able to say we toss and spin the pastry theatrically in the air like Antonio to make perfect thin bases but of course we can't so after several practice runs with a rolling pin to get the dough base thinned out without holes and to sit flat we can now make passable (almost) authentic if not exactly circular pizzas at home. 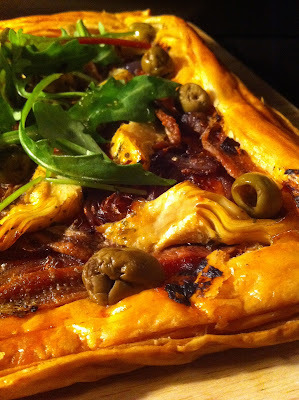 It is probably not necessary to say that there are almost an infinite number of toppings which can be used, any that work on pizza dough will work on puff pastry - all a matter of personal taste. Below is our suggestion. Perhaps the only essential ingredients are the pastry, tomato and cheese but then again even the tomato and cheese can be dispensed with. By the way pastry with a high butter content is usually the most successful. Roll or lay the pastry flat on an oven baking tray and cut a line into it about a centimetre all around being careful not to cut right through. Prod the centre of the pastry. Bake in a hot oven for 10 minutes. Remove from oven press down any air bubble in the centre and spread over the tomato paste. Then begin to arrange your favourite toppings over and bake for another 10 to 15 minutes or until you are happy with the result.